The commentators disagree in identifying the background and setting of the ninth chapter of Tehillim. 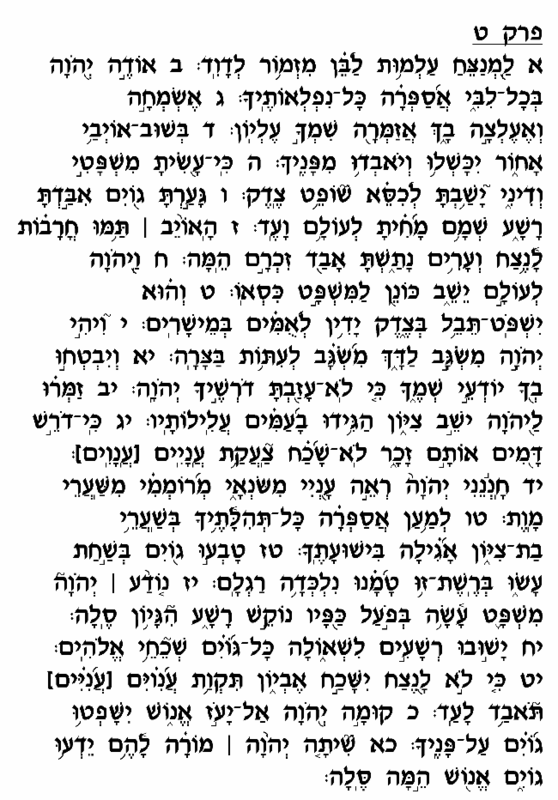 The straightforward reading of the chapter's opening verse implies that David composed this Psalm upon "the death of the son" ("Al Mut La'ben"), which some explain as a reference to the death of David's son, Avshalom, during his ill-fated revolt against his father (Shemuel II, chapter 18). According to this view, when David praises God here for the downfall of his enemies and the retribution visited upon them (verses 2-6), he refers to the death of his son Avshalom. As Rashi notes, however, there is no mention in this chapter whatsoever to this incident. We might also add that David speaks here in terms of a national, rather than personal, salvation. He summons all the "dwellers of <?xml:namespace prefix = st1 ns = "urn:schemas-microsoft-com:office:smarttags" />Zion" to sing praise to God who avenged innocent blood and heeded the cry of the downtrodden (verses 12-13), suggesting that it was all Israel, and not just he, who was saved from a vicious enemy. David makes reference also to the destruction of cities and the eradication of the enemy's memory, suggesting that he was saved from a hostile nation, and not an individual nemesis. Furthermore, the festive, triumphant tone of this chapter seems hardly consonant with David's mournful response to the news of Avshalom's death (Shemuel II 19:1-5). 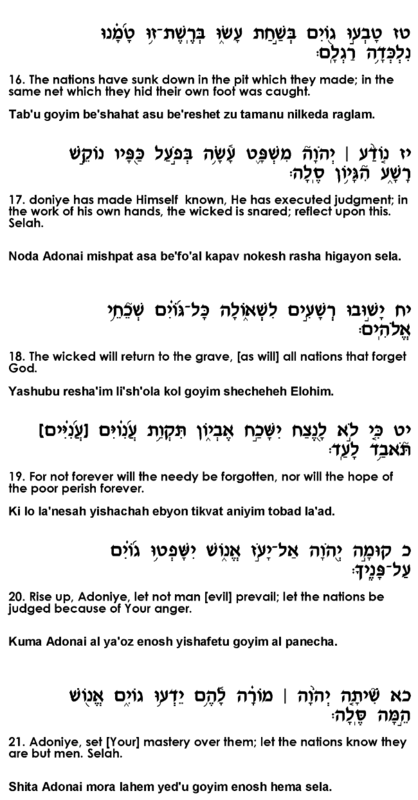 According to Rashi, David composed this Psalm as a song to be sung in the future, after the destruction of the wicked nation of Amalek. This explains the description to the enemy nation's "eradication" ("Machita" – verse 6), the same term used in the Torah in reference to Amalek's eventual downfall (Shemot 17:14, Devarim 25:19). David foresees the time when divine justice will once and for all be clearly manifest on earth, with the fall of the wicked, the vindication of the downtrodden and oppressed, and the avenging of the innocent blood spilt by Amalek and the other forces of evil. "For the destitute man shall not be forgotten for eternity, nor shall the hope of the destitute be lost forever" (verse 19). Although it currently appears that evil will hold its grip on mankind forever, and the plight of the innocent victims of tyranny seems hopeless, this situation will change in the future, when Amalek and the forces of evil are finally defeated. David concludes this Psalm by petitioning God to show the wicked nations that "they are human." Perpetrators of evil fancy themselves immune from divine retribution by thinking of themselves as powerful "gods" of sorts. Ultimately, however, this foolish illusion will be shattered, and they will be forced to submit to the authority of the one true God.